We are back again for a day of mornings Erin & I. This morning was hard to get a picture since I am in a new environment (new house and all), nothing of mine is around (everything is still in boxes) and I didn't know what to take a picture of. 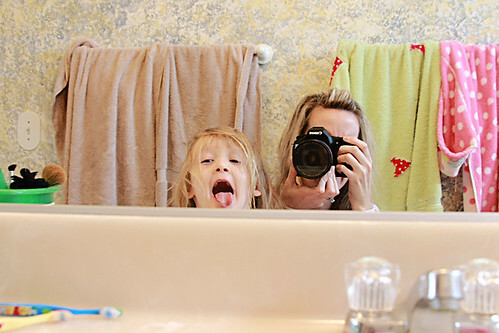 Gweniveve helped me out once she started making faces into the mirror while I was trying to get ready thins morning. I do have to admit I had like 10 other pictures on my camera of things that I had taken pictures of and I wasn't liking anything. I HATE when that happens. If you want to see more of Erin & my adventures in Morning Between Friends here is the group we have set up on flickr for all of our pictures. love the pic. the wallpaper reminds me of that scene in Garden State where his shirt matches the wall paper. you should do that. 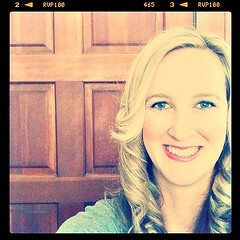 Excited to see the mornings again...will have to pop over to Erin's blog.